I agree that the Warrendale Community Organ- ization has the potential to do a lot of great things for our neighbor- hood. The problem, however, is that out of a neighborhood with 9,036 homes there is usually only a dozen or so people who show up at their meetings. In fact, when the WCO did a clean-up of the Southfield Freeway service drive last May, there were more people who came to help out from Macomb County then there were from the Warrendale neighborhood. 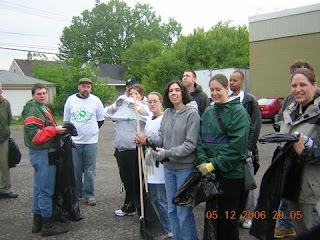 Think about that one: folks in Macomb County have absolutely nothing to gain from seeing a portion of the Warrendale neighborhood cleaned up, but there were still more of them helping out than there were folks who live right by it. This is in spite of the fact that flyers were hand-delivered to everyone who lives along the service drive and it was announced repeatedly including on this blog. Now it's a New Year. A chance for a gigantic "do-over." A time to move beyond blaming others. A time when folks make resolutions and (hopefully) keep them. With that in mind, please allow me to say this. There won't be a WCO meeting in February because of scheduling problems. The next one will be on Monday, March 5 at 7 p.m. in the Activities Building of Sts. Peter & Paul Church. I invite and encourage everyone in the neighborhood to stop by. I also invite the dozen or so people who have emailed me privately to say that they used to live in Warrendale and wish us the best to stop by as well. Your input and involvement is welcome even if you no longer call the Warrendale neighborhood home. If you work the afternoon or evening shift somewhere and can't make it to the meeting, I invite you to send me an email (frank.nemecek [at] gmail.com) and I'll see if I can find a way to get involved that meets your schedule. To rid Warrendale of prostitutes and narcotics..You have to stop the sale of narcotic paraphrenlia. - to local crack heads and visiting crack heads, and prostitutes. a dollar store at WWarren-Grandville for selling Crack Pipes after, my complaint that they sold Crack Pipes to a 10 year old. Crack Pipes are small 4" glass tubes with a tiny silk flower inside them or a glass tube that looks like a pen. Stop the stores..call the police or Wayne Co. Sheriff's..
Frank, I would love to get your help. I am a police officer at the nw dist. working special operations. If you or anyone in waco wants to report dope houses to me then come and meet me at the nw dist. at 7pm and tell the desk you have come in to see plainclothes officers "psycho" and "crazy" and we'll talk.